If you believe that your cigarettes have a permanent hold on you and you’re looking for a real solution to help you quit for good, then you may want to read carefully what I’m about to share with you. Because the next few pages will reveal things you’ve never seen before. When we search for the best way to quit smoking, we often end up with generic advice from online articles, books, companies and medical professionals trying to promote nicotine products. But the advice we get rarely works… and in most cases, makes quitting harder. The truth is, there are things you are doing right now, or plan to do in your next quit attempt… that can single-handedly cause you to struggle and fail. But what I’m about to share with you is going to be different. I will show you what is the most effective way to quit smoking. And most importantly, WHY and how it works. And when I say effective, I mean the easiest way to stop smoking naturally without suffering from cravings and without missing cigarettes ever again. Because quitting while missing cigarettes isn’t going to work. It’s a recipe for failure. And you probably know that. So this information is going to be different, and you’ll see why as you keep reading. But before I get into that, I need to give you a fair warning. But you are not going to quit just by reading words on a page. The same way, reading a book about losing weight won’t make you shed a single pound unless you apply the solutions and tools you learned. Same here. Learning how to stop smoking effectively, won’t make you quit. But it will show you how to do it and find it easy. Even if you’ve been smoking for years, spend a lot of time with other smokers, or believe you NEED cigarettes to cope with the ups and downs of life. And … why should you listen to me? My name is Nasia Davos; I’m a Psychologist, author, certified Life Coach, and Smoking Cessation Coach. And most importantly… I used to be a smoker too. I used to smoke nearly 1 pack a day. My wake up call was losing my cousin at the age of 43 from lung cancer due to smoking. And yes, even after that tragedy, I still found it impossible to quit and cope without my cigarettes. After failing multiple times and trying several methods, I was convinced that quitting is hard and I can’t do it. I thought I was doomed to smoke forever. What I discovered, enabled me to create a process that helped many smokers quit without struggling, without using willpower and without any nicotine substitutes. …Because it has a 94% success rate. 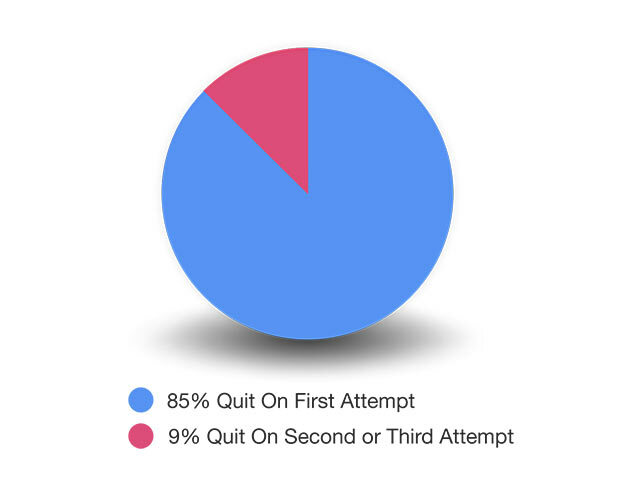 85% of smokers quit permanently on their first attempt, and 9% quit on their second or third attempt. I know this might seem too good to be true, or maybe hard to believe. So all I’m asking is to keep an open mind and suspend that disbelief – just for now. See, every year only 6% of the smokers who try to quit eventually succeed. One of them was Lisa, who reached out to me a few months ago. Lisa was in her mid-40s, married with two beautiful children ages 8 and 11. However, few months ago, after waking up with a severe cough and unexplained chest pains, she reached out for help. But Lisa, like all of us, was afraid of failing. In the past, she tried to quit with vaping, nicotine gums and smoking pills, but nothing worked. It was just too hard to cope with the stress, the cravings, the lashing out and the weight gain. She ended up smoking again. Every single time. And you know, that first cigarette after relapsing gives you the greatest relief and the greatest regret. Relief because it ends your momentary suffering. Regret because all the pain you went through was for nothing. I explained that “All the side effects of quitting smoking… the stress, the weight gain, the irresistible cravings, the anger, the deprivation, are NOT the reason why quitting is hard. I said: “If you think you don’t have enough willpower to resist cigarettes… is because you’re trying to quit the wrong way. Imagine you’re trying to bake a cake for the first time. If you don’t follow the right recipe- or any recipe at all- you will find it really hard to bake that cake! But it’s easy if you follow the right steps, and do it the right way. The same goes for quitting smoking. It is easy. But when you quit the wrong way, it becomes hard, and you experience side effects. Quitting smoking the right way means having closure and feeling ready to move on. It means you really QUIT, and do not still desire or crave a cigarette. The wrong way, means you are abstaining from smoking for prolonged periods of time while trying to resist it with willpower. But… what is the difference between “Quitting” and “Abstaining”? Nasia is an ex-smoker, published author, TEDx speaker, Certified NLP Life Coach and Practitioner with a BSc in Psychology and an MA in Psychoanalysis. She is a Smoking Cessation Practitioner and member of the Red Cross. Her extensive research on Smoking Cessation has helped thousands of lifetime smokers quit easily and turn their lives around. Nasia is an ex-smoker, published author, TEDx speaker, Certified NLP Life Coach and Practitioner with a BSc in Psychology and an MA in Psychoanalysis. She is a Smoking Cessation Practitioner and member of the Red Cross. Her extensive research on Smoking Cessation has helped thousands of lifetime smokers quit easily and turn their lives around. Join our New Quit Smoking Facebook Support Group and Get Help Along Your Journey. 5 Popular Ways to Quit Smoking – Which Works Best?